t*rexes and tiaras: Tuesday Titles 019: Season to Taste by Natalie Young..
Tuesday Titles 019: Season to Taste by Natalie Young.. 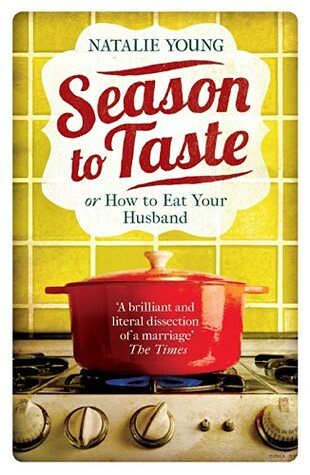 Season to Taste is one of those books I'm struggling to find the words to review. I was intrigued by the premise: woman decides to kill her husband and then eat him, to get rid of the body. Um. I'm not spoiling anything by sharing the fact that housewife, Lizzie Prain kills her husband. It's right there on the front of the book, so this murder is anything but shocking. Much like the rest of the book, to be honest. Gruesome, yes. I was starting to get a little fed up of hearing about how the axe kept getting stuck in the corpse's bones as Lizzie tried to cut it up into manageable pieces for her dinner, and what particular recipe she was going to use for each part of Jacob's anatomy. This book certainly is not lacking in recipe inspiration. What I did find it lacked was, well, how can put this? Anything to keep the reader interested. Unless you're particularly interested in the minute details of how Lizzie cut off her dead husband's whatsits and consumed them, I don't know that you're going to find a lot to engage you. Another thing it lacked? A reason for Lizzie to kill him in the first place. I'm not sure what brought that on as it sounds as though Jacob was just as boring as she was. I thought that perhaps I felt a little sorry for Lizzie. She has spent a huge part of her life stuck. In a monotonous marriage. In a cottage in the middle of the woods. In a small town where everybody likes to think they know your business. Somehow, this book could have been about getting out, and getting away, and making a new start like Lizzie plans to do in Scotland. But it just isn't. And I realised that I didn't feel sorry for her at all because she didn't deserve that. Lizzie does go to Scotland. Then she comes back again. She finds a new job, then decides not to take it. Then changes her mind again. She doesn't seem to know herself well enough to know what she wants, which makes it impossible to pique the interest of the reader. She writes herself a list of notes throughout the course of the book, to keep herself on track with her only task. These come across as so matter-of-fact and uncaring that I did wonder if this was some kind of pathological insight into the mindset of a killer, but they just don't seem to fit with the rest of her actions. Honestly, I'm afraid I don't think I'd recommend this. It just seemed like it could have been a good idea but didn't quite get there. You might have more luck with it than me, though. I agree, I think it could have been so much better. I won't bother adding this to my to-read pile then. Nothing more disappointing than a good that doesn't deliver. I don't think I would have bothered to finish it to be honest - I always feel bad for the author if I give up on a book but I think there are too many fantastic books out there to waste time on a bad one. I sort of agree, but I do find it ever so hard to put a book down without finishing it, and even more so when I'm supposed to be reviewing it. Yeah, an odd premise, but sort of failed to deliver. Yep :( A bit of a let down.